We offer expert installation for any type of project. 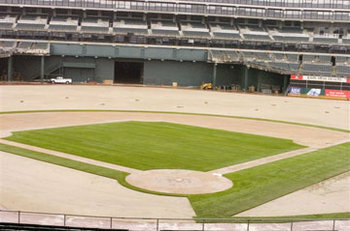 The exact same crews that install sod for the Super Bowl or World Series use the same care to install your sod quickly and dependably at your California or Arizona home, too. The terms sprigs and stolons are used interchangeably, referring to pieces of above ground or below ground grass stems for creeping grasses (usually hybrid bermuda). Planting stolons is an alternative to sodding. When planted during the spring or summer months (May-July), stolons can achieve the look of sod in 10-12 weeks, providing warm weather, proper irrigation, mowing, and fertility needs are met. Hydroseeding is a proven method for establishing blends and mixes of seed, performed by our Western Sere hydro group. Seed, fertilizer, mulch, soil conditioner, and tackfier are combined with water and placed in our hydroseeding equipment. When all ingredients are thoroughly mixed, the slurry is sprayed over the prepared site. A green "mat" covers the newly seeded area. That's the hydromulch, and it performs these 3 valuable functions. Moisture Retention: Seed is kept moist because hydromulch retains 10-15 times its weight in water. Water is the key ingredient for a quicker and thicker seed establishment. Erosion Control: Wind and water erosion can prevent satisfactory results. Hydromulch "blankets" the area and helps to prevent these problems from occurring. Seed Protection: Hydromulch helps maintain soil temperature and protects young seed from the scorching sun. It forms an almost perfect micro-climate for maximum germination. As your seeded area becomes established, the hydromulch will gradually decompose and disappear. Large, open, relatively flat areas can be planted quickly with readily available, inexpensive, tractor-drawn equipment. 10 acre minimum. Seasonal. Sod is cut in 42” wide rolls, and can be up to 100’ long. Big rolls are ideal for large open areas. It is quick, efficient, and cuts down on seams. Instead of the standard ½” thick cut, sod is cut up to 2” thick. Ideal for areas that need to be in use quickly, or in some cases, immediately. Whatever seed mix or blend you need, West Coast Turf will grow it for you on whatever soil or sand profile you wish. Our Field TopMaker machine can be used in a number of ways to level, clean, de-thatch, and renovate turf areas, as well as the harvesting of sprigs. It is ideal for use on soccer fields and any athletic fields, golf courses, polo fields, municipal grass areas and sod farms. The Field TopMaker is the machine to bring turf surfaces into perfect condition. It consists of a series of blades which can be adjusted from 5 cm above the surface to 5 cm below the surface. The cut material can be deflected back on to the surface, or transferred by built-in conveyors direct into trailers for removal off site. The machine has a high working capacity and fine adjustment is possible. A typical athletic field can be leveled and cleaned in one or two days. You name the place, and we’ll ship it to you! Our refrigerated trucks come from Arizona and California and are standing by to deliver your sod. We can also prepare your turf for shipping by air to overseas destinations. Soil is removed from the sod to create a “bare root” product. This is used to eliminate sod to soil incompatibilities, conform to some agricultural restrictions, help the sod knit to the soil faster, and reduce shipping weight.